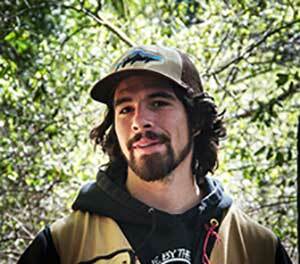 Joaquin Quintana was hired as a full-time Forestry Technician for the Redwood Forest Foundation’s Usal Redwood Forest Company (URFC) in March 2017. RFFI has taken over the direct management of the Usal Redwood Forest, marking the first time in over 100 years that the forest has been under a non-industrial timberland manager. Born in the redwood region, Joaquin’s affinity for redwoods and his rich and varied background make him an apt choice for this position. Joaquin’s unique experience working at Redwood National State Park was a perfect introduction to the complexities of managing a working community forest, such as our Usal Redwood Forest. At the park, he inventoried coastal redwoods within the Lower Prairie Creek watershed and monitored sites inland along Holter Ridge road. On the one hand, it prepared him for work in a similar ecosystem with coastal redwoods. On the other, it gave him experience dealing with community expectations and the tension and synergies between forest restoration and timber harvesting. This was a unique situation. The property had been so severely over-harvested prior to its inclusion in the park system that it required extensive restoration, including removal of trees from overcrowded, unhealthy stands. Joaquin worked in a restoration project unique to State and National Parks-one that necessitated timber harvests. During his internship he observed an increase in forest health, biodiversity and redwood growth, derived from the extraction of merchantable timber. This is analogous to the situation in Usal Redwood Forest, where judicious timber selection and harvesting is part of an extensive effort to restore the forest and reestablish critical fish and wildlife habitat. For most of the past 6 years he has immersed himself in forestry and natural resource education and work experience. He attended Cabrillo College in Santa Cruz, CA and spent time in Nisene Marks and Big Basin State park biking, hiking, and collecting edible mushrooms. These experiences motivated him to pursue a degree in forestry at Humboldt State University and now a career in forestry. This month he and his fiancé, Bre, opened a new chapter in their nine-year relationship when they moved, with their two dogs, to the Ten Mile area north of Fort Bragg, CA. mountain biking. Even Joaquin’s hobbies have a serious side. His pottery-making was with Sam Clarkson, Tom Watson and Jasper Mariano- all legends. Sam Clarkson taught him how to harvest local clay and process it to make pottery, which led to his interest in soil science. His gardening efforts started with a permaculture course. Hopefully, his love of gardening and his emphasis on soils science will prepare him to help with RFFI’s revitalized biochar project.